Be prepared for timeless and traditional sophistication with the Marina Arm Chair. 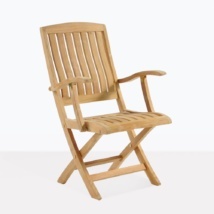 The Marina Arm Chair: Solid, long, compact and ready to go from our warehouse to your home. 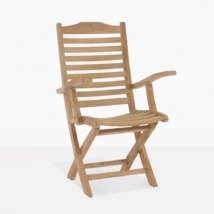 The Marina Arm Chair is perfect for anyone who needs a bit more room at the table. 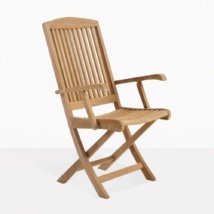 This folding teak chair has a brilliantly tall back, wider arms, and elegant, curved slatting; the Marina Arm Chair is ideal for a taller person who needs a little more back support, or for someone who loves a majestic look at the table! 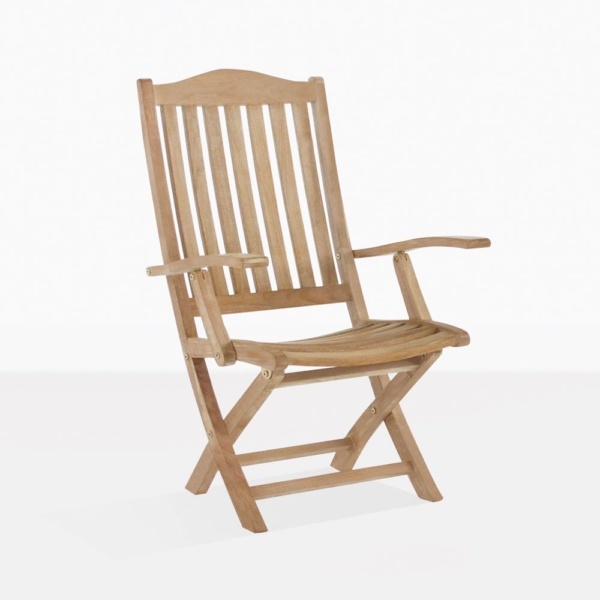 W22" x D26" x H42"
Compatible with a variety of our A-Grade teak dining tables, this convenient folding arm chair is perfect for those outdoor dinners! The Marina Arm Chair also has an accompanying Side Chair, so you can create a grand setting – start with one of our glorious Hampton Tables, available in two lengths, with two Arm Chairs serving as ‘heads’ of the table and the Side Chairs down each length for the ultimate dining area fit for a King! Choose the Marina Arm Chair for your porch with a Milano Side Table; setting you up in style for morning coffees, or perhaps an evening drink in the sun, or even just to take a breath and unwind after a long days work. These gorgeous, classic pieces are fantastic around a café table as well, ensuring you have the perfect setup for any occasion! Try two Marina Arm Chairs with a Tango Square Folding Table for intimate lunches and delicious brunches for two! 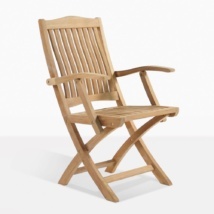 This folding teak chair is made of glorious A-Grade Teak, perfect for the outdoors because of its natural oil and rubber running throughout the wood, meaning it looks better and lasts longer than many other wood products. There’s no two ways about it; A-Grade Teak is the superior choice for outdoors. If you have any questions about this or any of our other marvelous products, call us on the 1-800 number on the website! Our sales staff are here 7 days a week to help you with all your furniture needs!